WHAT ARE THE BEST ONLINE MASTER'S IN NEGOTIATION & CONFLICT MANAGEMENT PROGRAMS? What Else can I Expect from an Online Master's in Negotiation & Conflict Management Program? A typical day as a negotiator or mediator involves diffusing employee/employer issues, helping governments find common ground with foreign entities, working with two parties to settle a legal dispute, or helping neighbors figure out who needs to pay for a fallen tree. Employers are seeking graduates in this field. The Bureau of Labor Statistics projects that, between 2014 and 2024, the field will see an employment growth rate of 9%. A master's in conflict resolution online prepares students to pursue many lines of work. Master's degree in conflict resolution online programs are interdisciplinary in their approach to education, so the vast majority do not have requirements for previous experience. Research numerous master's in conflict resolution online degrees and figure out what you need to succeed in the program. Some programs offer specializations, while others are more generalist in their approach. It's important to know whether you prefer synchronous or asynchronous studies. A synchronous program will require you to login at specific times to complete work; asynchronous programs allow you to complete assignments based around your own schedule. Get to know the nuts and bolts of these programs, compare their requirements with your needs, and try to find one that balances both. CAN I WORK WHILE I COMPLETE MY ONLINE MASTER'S in NEGOTIATION & CONFLICT MANAGEMENT? Many grad students work while completing their degree, but it takes focus and dedication to balance both. Degree seekers spend an average of 10 hours per week, per class, to complete assignments. So if they take three classes, they'll need to devote 30 hours per week to their studies. WHAT ARE THE ADVANTAGES TO EARNING MY MASTER'S ONLINE? Completing a master's in conflict resolution online offers students the opportunity to earn a degree from any school in the country. Online programs are also more flexible and make it easier for students to maintain employment. Learners earn the same degrees and certificates that on-campus students receive. George Mason’s School for Conflict Analysis and Resolution is an incubator for best practices in the field. The school is actively engaged in initiatives around the globe, including the Genocide Prevention Program and the Sudan Project. Through Mason Online, the school administers the world’s largest conflict analysis and resolution program. The 42-credit MS in conflict analysis and resolution can be taken full-time or part-time. Students learn how to resolve conflicts through simulations, workshops, and field experiences. Coursework in the master's degree in conflict resolution online include conflict analysis and resolution, conflict inquiry, reflective practice in multiparty conflicts, and gender and violence. Students are required to complete a master’s thesis or an internship. The program is delivered asynchronously, though some electives may not be offered online; a one-week residency is required on campus in May. Admission requirements include a bachelor’s degree with a minimum 3.0 GPA and coursework in the social sciences. DU’s 48-credit MA in communication management with a concentration in alternative dispute resolution is comprised of 12 courses delivered online in 10-week terms. Early to mid-career professionals learn how to integrate mediation and conflict resolution skills into their present careers, making them invaluable negotiators in any profession. Areas of study include communication in professions and organizations, persuasion methods and techniques, communication for change movement, and effective communication in teams. The forty-hour mediation course is designed for students who desire a career in mediation, helping them integrate particular skills into their present roles. The program is flexible, allowing students to design a plan that addresses their area of interest. 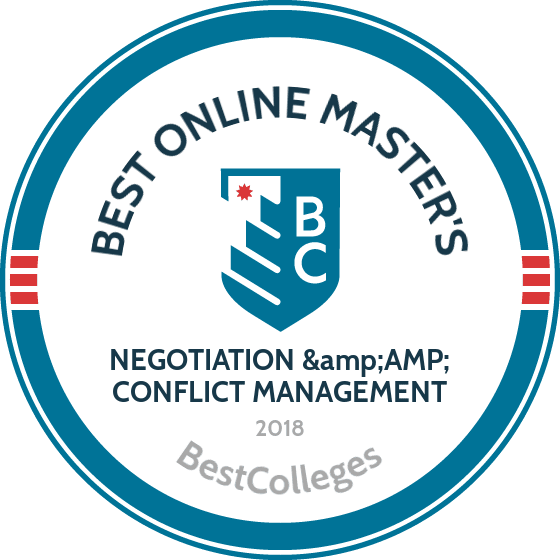 A master's in conflict resolution online prepares graduates for careers as arbitrators, dispute resolution analysts, dispute coordinators, and dispute resolution specialists. Admission requirements include a bachelor’s degree with a minimum cumulative 2.5 GPA. The GRE and GMAT are not required. Creighton University blends quality academics with its Catholic and Jesuit values. The school's online offerings include the 32-credit MS in negotiation and conflict resolution, which is taught by leaders in the field. Students learn the tools and techniques to analyse conflict in the workplace and bring it to resolution. Coursework in the master's degree in conflict resolution online covers the dynamics of conflict resolution, systems and consulting for conflict specialists, gender differences in conflict, and facilitating group processes. Students choose one of four concentrations: healthcare collaboration, international negotiations, organizational collaboration, or applied interdisciplinary research. Two residencies are required--one for the negotiation and conflict resolution course and the other for the study of mediation. Admission requirements include a bachelor’s degree with a minimum 3.0 GPA. The GRE is not required. The program can be completed in 18 to 24 months. The ability to negotiate and resolve conflicts in and outside of the workplace is a coveted skill that ACU helps students develop through the MA in conflict resolution and reconciliation. The 36-credit program trains professionals for peacemaking positions such as ombudsman, facilitator, and mediator. Coursework in the master's degree in conflict resolution online includes the study of conflict theory and communication, negotiation and mediation, managing conflict in the workplace, and dispute resolution in the legal system. Online courses at the Texas-based institution are delivered through six- or seven-week terms, allowing students to take classes one at a time. Admission requirements for the master's in conflict resolution online includes a bachelor’s degree with a minimum 3.0 GPA and college transcripts. Probationary status may be given to those with a lower GPA. The school offers financial aid options, including grants and loans. NU Online offers programming to accommodate busy schedules, including the MS in diplomacy. The program is designed for students pursuing careers in international relations and related fields. The 36-credit degree attracts students from the military, government, and law enforcement who want to develop knowledge about international, cultural, political, and geographical complexities that affect global affairs. The program, which can be completed in 18 months, includes course subjects in the international system, the history of diplomacy, and law and the international system. Students in the master's degree in conflict resolution online are required to choose 24 credits in one of four concentrations: international terrorism, international commerce, cyber diplomacy, and international conflict management. One culminating weeklong residency is required on the campus in Vermont, during which students meet peers and faculty and engage in study and dialogue. Admission requirements include a bachelor’s degree with a minimum 2.75 GPA; no GRE or GMAT is required. Completing an online master's in negotiation and conflict prepares students for exciting job opportunities. The flexibility of this style of learning also makes it possible for working professionals, or those with personal responsibilities, to further their education. Students should expect to complete a capstone project that requires them to apply their skills to the real world. The courses below provide an example of the topics commonly covered in a master's degree in conflict resolution online. Classes offered by individual institutions may vary. Conflict and Cooperation: Usually taken as an introductory course, conflict and cooperation examines the discipline as an academic field. Students learn about the contributions made by areas of social work, social psychology, law, political science, and business. Intrapersonal Dynamics in Conflict: Students delve into the cognitive, emotional, temperamental, motivational, and communication styles that drive intrapersonal dynamics. A range of self-assessment tools are also introduced that apply to the real world. Advanced Mediation: Helping two or more parties find common ground is a familiar duty of conflict managers and negotiators, and this class provides the skills needed to offer services to diverse groups. Distance learners review case studies, complete exercises, and take part in discussions about biases. HOW LONG DOES IT TAKE TO GET AN ONLINE MASTER'S IN NEGOTIATION & CONFLICT MANAGEMENT? Completing a master's in conflict resolution online typically takes between 16 and 24 months, but numerous factors can affect this timeline. Many colleges and universities offer the program in a cohort style, meaning degree seekers will be assigned to a group of peers and move through coursework together rather than being able to choose their own pace. Some programs may only be offered on a part-time basis, while others allow for full-time studies. Because a master's degree in conflict resolution online is an interdisciplinary program, students aren't commonly required to hold a bachelor's degree in the same subject. Students from liberal arts, humanities, and business backgrounds have likely already completed all the prerequisites required for this degree path. Licensure typically isn't required to work in this field, but some states require mediators to receive advanced mediation training to become part of the roster of mediators used within courtrooms. Those interested in this type of role should check with their state's Department of Justice to learn more. Mediator Certification: The National Association of Certified Mediators offers this training to individuals who have already completed at least 40 hours of advanced mediation training. Students pay a $249 testing fee to sit for the certification exam. Harvard Negotiation Institute: Harvard University offers five-day courses focused on aspects of mediation and negotiation, with emphasis on training lawyers, government employees, executives, and professionals from many different fields of business and industry. Accreditation ensures that colleges and universities are qualified to provide educational services. Institutional accreditation typically takes one of two forms: national or regional. National accreditation is commonly earned by vocational and career-oriented schools. Regionally accredited schools go through a multi-step (and often multi-year) process of demonstrating qualifications and proficiency before being awarded accreditation. And schools must demonstrate continued proficiency in order to maintain their accreditation. Field-specific accreditation exists for some academic disciplines and degree paths, but there currently isn't an accrediting body for master's in conflict resolution online programs. If interested in learning more about the accrediting process, distance learners can visit the websites of the U.S. Department of Education (ED) or the Council for Higher Education Accreditation (CHEA). Both of these agencies are tasked with ensuring that the standards of accreditation are maintained and that accrediting bodies continue to hold schools to the highest standards. Both the ED and CHEA websites maintain up-to-date lists of schools that currently hold accreditation. Data shows that conflict is a significant issue in the workplace that has grown in recent years. According to the CPP, 85% of employees experience conflict at some level, while 29% face almost constant conflict within the workplace. This surge in situations requiring mediators opens the door to increased opportunities for in-house and freelance positions. The table below features data from PayScale. It demonstrates expected salaries for common roles within the field of negotiation and conflict management. Individual salaries can be affected by workplace dynamics, level of education, and years of experience. Negotiation and conflict management graduates have many career options due to the interdisciplinary nature of their field. They are prepared to provide in-house counsel and serve clients in a consultant role. Successful negotiation and conflict management professionals can find common ground among disputants, aren't bothered by confrontations, and are able to work with many different types of personalities. Professionals in this career facilitate discussion and negotiation between parties disputing a contract, agreement, or other matter. They conduct arbitration, interview claimants and other parties involved, and prepare settlement agreements. Working in or around the court system, hearing officers research legal issues, evaluate hearing documents, hear arguments, and make decisions by applying law or precedents in order to reach a judgement. They also write opinions and decisions. Paralegals support lawyers by preparing cases for trial. Tasks include file organization, legal research, document drafting, and organizing files into electronic databases. They also handle minor legal filings such as exhibits, briefs, and appeals. These specialists identify workplace hazards, test potentially toxic materials, investigate accidents or claims, and provide reports on their findings. Representing individuals, government agencies, for-profit entities, and nonprofit entities alike, lawyers provide advice to their clients on legal matters. They conduct research, interpret existing laws, seek precedents for cases, and go before the court to defend their clients. Member associations within the field of negotiation and conflict management help professionals in this industry access research, continue their educations in negotiation and mediation tactics, and offer an important outlet for them to connect with peers. Some associations even provide job boards and referral programs to help members find their next client. ACR holds an annual conference and has local sections and chapters. The organization also provides a referral list, continuing education, and access to a range of publications to all members. The association offers member discounts for materials regarding mediation and arbitration. AAA connects individuals or companies seeking arbitration services to its vetted roster of member mediators. The group also provides continuing education and a variety of resources. NAFCM helps members advance their work through practitioner and program resources, podcasts, continuing education, an active blog, and a range of events on the community calendar. With the cost of graduate school averaging between $20,000 and $30,000 for public and private educations, respectively, many students are anxious to find significant funding options before committing to a program. The first step for any prospective distance learner is to fill out the Free Application for Federal Student Aid. The FAFSA provides info on scholarships, grants, loans, and work-study opportunities available through the federal government. The Public Service Loan Forgiveness program is for individuals who plan to work for a nonprofit or within the government after graduation; the FAFSA will help you find out whether or not you are eligible. Other funding sources include private foundations, negotiation and/or mediation associations, and departmental/institutional scholarships.